Stop me if you've heard this one before: There's this famous car brand whose average driver is more familiar with Social Security than social media. General Motors Co. will make another attempt to get Buick to appeal to younger buyers with freshened up versions of the Regal midsize sports sedan and the LaCrosse large luxury car. GM unveils the pair Tuesday ahead of the New York International Auto Show. Youth has been the theme of several of Buick marketing campaigns during the last three decades, with famous pitchmen from Tiger Woods to Shaquille O'Neal. Sales have even risen recently after a dramatic and lengthy decline. But even with that recent success, odds are against GM making Buick a go-to option for large numbers of drivers below the age of 50. Buick, once coveted for its understated elegance, used to be a dominant brand. In 1984, GM sold 942,000 Buicks in the U.S., according to Ward's AutoInfoBank. But many Buick buyers died, and younger people opted for SUVs and cooler European cars. Sales tumbled, bottoming out at just over 102,000 in 2009. GM only kept the brand alive because it became a huge seller in China. The company doesn't expect Buick sales to approach 900,000 per year again. But executives say they can still make a lot of money selling the higher-priced luxury vehicles with lower sales numbers. GM is giving the LaCrosse a more sculpted, modern look. It gets updated LED daytime running lamps and tail lights and a larger front grille. On the inside, it gets new, more supportive seats and a modernized center stack with fewer buttons than the current car. The interior will have more of a luxury feeling to differentiate it from the sportier Regal. The Regal also will be updated, but details won't be released until later Tuesday. The New York International Auto Show opens to the media Wednesday. The LaCrosse goes on sale late this summer and the Regal comes out in the fall. Prices and gas mileage weren't released. 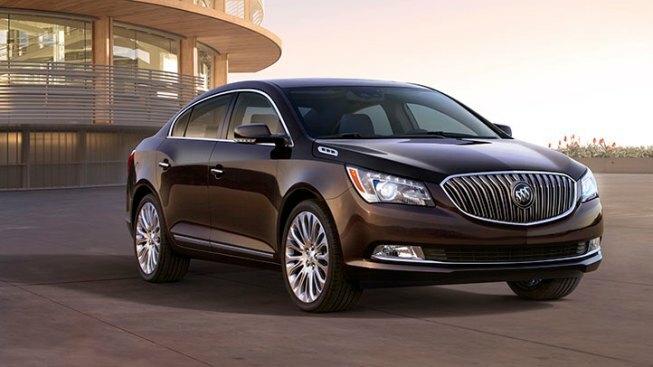 The current Regal starts at $29,015, while the LaCrosse starts at $31,660. Buick sales rose the past three years, and reached 180,000 in 2012. The catalysts were the new Verano, a compact based on the Chevrolet Cruze, and the Enclave, a big crossover SUV, that got a facelift last year. Also, Buick's new Encore small SUV is just starting to hit showrooms. The new products have helped to change Buick's demographics. In 2006, Buick buyers on average had celebrated 66 birthdays. Last year that fell to 57, according to the company. The Verano helped there as well because small cars tend to draw younger buyers. But Buick buyers are still older, and the automaker would like to catch more people in their 40s. The average car buyer in the U.S. is 52, according to the TrueCar.com auto pricing site. Even with the new cars, Buick hasn't kept up with the industry. Last year, sales grew only 1.6 percent even though total U.S. auto sales rose 13 percent. Spokesman Nick Richards blames the slow growth on a cut in low-profit sales to fleet buyers such as rental car companies as GM tries to boost the brand's resale values. He says retail sales to individual buyers rose about 6 percent. Still, Buick's five models combined were outsold last year by single models from other automakers. Hyundai, for instance, sold 202,000 Elantra compacts last year, beating Buick by itself. Members of the Obama administration's autos task force asked about getting rid of Buick in 2009, during GM's government-funded trip through bankruptcy court. But Buick survived because of a strong following as a luxury brand in China. Chinese drivers bought more than 700,000 Buicks last year, up 8 percent from 2011. In the U.S., Buick likely won't approach those numbers because the stodgy image clings to the brand. "The vehicles themselves are very suited for young driving habits. Good fuel economy, performance, nice looking," said Rebecca Lindland, owner of Rebel Three Consulting of Greenwich, Conn.
"But it's still not cool to be in a bar and say you have a Buick."